Oh, hello cooler weather, how are ya doing? Seriously, I want to sit down with the weather, drink a cup of coffee, and chat about it’s intentions. Is it here to stay? Are we getting some relief? Autumn, is this really you? I don’t know about you all, but I love waking up to these ~50 degree mornings, donning a cardigan, and using the seat warmer on the drive to work (I have a slight addiction to that feature, hooray for 21st century cars!). I also love finding ways to use the last of the summer vegetables while giving them a more savory, fall twist. And just like I enjoy mixing seasonal flavors, I also love dreaming up new meals from two different, inspiring recipes. When I saw these risotto stuffed banana peppers on What the Hell Does a Vegan Eat and the recipe for Thai Basil Coconut Lentils, I knew I wanted to mix up the two ideas, come out with a winner that would celebrate the front garden banana peppers and still be filling (you know, that whole boyfriend-who-eats thing). With only four banana peppers in the garden to work with, the meal was largely curried lentils and rice, but I loved the sweet peppers paired with the green curry. Over it all, I drizzled a little basil lime vinaigrette inspired by the risotto stuffed peppers recipe which added a little more color and burst of fresh basil to the plate. Not the quickest of weeknight meals, but definitely worth it for the Thai-inspired flavors! Rinse the lentils and place in a medium sauce pot with 1 tsp salt. Cover with water (at least 2 inches above the lentils) and bring to a boil. Cook for 25-30 minutes, until al dente when tasted. When finished cooking, drain and set aside. Meanwhile, Pre-heat the oven to 400 degrees Fahrenheit. Cut a slit down one side of each banana pepper. Carefully pry open just enough to scoop/scratch out the seeds. Be careful, the peppers will tear. Don’t worry about getting all of the seeds out of the cap area, just the ones in the middle of the pepper. Place on a baking tray and drizzle with olive oil. Use fingers to coat the outside and inside with oil. Set aside. Over medium heat, warm 1 tbsp olive oil. Saute the onion until translucent, ~5 minutes. Add the napa cabbage and zucchini and cook for 5 more minutes until the cabbage begins to wilt and the zucchini begins to soften. Add the cooked lentils, curry paste, and coconut milk. Stir to combine. Simmer for 5 more minutes. Remove from heat. 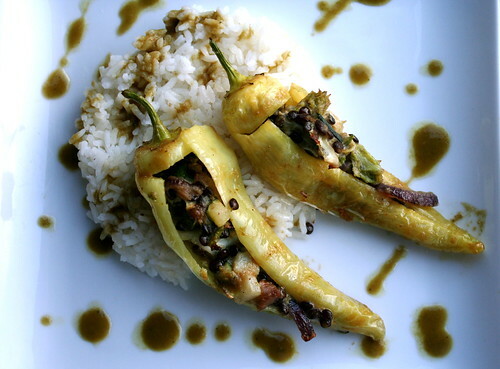 Fill each de-seeded pepper with several tablespoons of the curried lentils. Place slit side up on the baking tray and bake for 12-15 minutes, until the peppers begin to soften and brown. Remove from the oven and set aside. To make the basil lime vinaigrette, combine the basil, lime juice, salt, and oil in a blender. Blend until smooth. Adjust each ingredient to taste. Looks amazing! What a creative idea, I also love the presentation! i love beluga lentils! 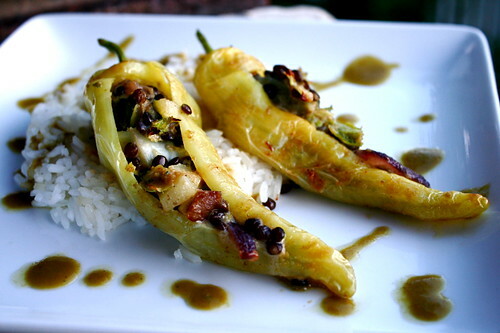 they look so delicious stuffed into these banana peppers! A savoury fall twist on summer vegetables: I like it. I never think to do Thai stuff at home – and never with peppers. But peppers stuffed with most things are usually good, right? I’m glad you put those precious few banana peppers to good use. I love everything about this! The recipe sounds great and the presentation looks awesome. These look awesome, Jes. I love the way you dressed the lentils with the green curry and used some cabbage and zucchini, too. And the coconut milk is a great touch! I’ve been using that lately, too, and have made it a pantry staple. Lovely presentation! I thought I was the only one who ever made stuffed banana peppers. Mine has a tempeh filling. Love the green curry filling! Such a beautiful presentation too! Mine never looks half as good.